BATON ROUGE — Two key members of the Louisiana Legislature discussed hot issues in the current session at the Chamber EBR monthly meeting March 25. Sen. White was unable to attend. Rep. Brett Geymann, the leader of the Fiscal Hawks and conservative Baton Rouge lawmaker Rep. Barry Ivey discussed their own legislation and other major bills expected to make headlines during the session. Geymann’s group of lawmakers has growing influence on state budget matters. Ivey is sponsoring legislation on Louisiana’s public notice laws. The monthly meeting is held at Café Américain, 7521 Jefferson Hwy. on the 4th Tuesday of the month. The reception begins at 11:30 a.m. and lunch at 12 noon. The meetings are open to business owners in the Baton Rouge area, guests, and members of the news media. Lunch is $15 and is complimentary for members of the working media. The Chamber EBR is affiliated with the U.S. Chamber of Commerce. 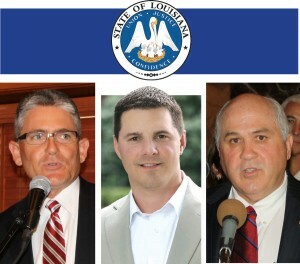 For information on the Chamber of Commerce of East Baton Rouge, go to www.ChamberEBR.com.